In 1996, anthropologist Carlos G. Vélez-Ibáñez published Border Visions: Mexican Cultures of the Southwest United States with the University of Arizona Press. The book was hailed as a comprehensive guide to border culture, distilling historical, sociological, and anthropological perspectives. It has been taught in courses across the country. Today, the author reflects on the book’s publication and what’s changed since its publication. It has been twenty-two years since Border Visions was published and the U.S.-Mexico transborder region has suffered through many changes. Since then, my own work has changed significantly. Fundamentally, I understand now that my previous work generally cut off at that bifurcation we call the border. Border Visions began much more broadly in telling the narrative of the south-to-north movements from the pre-Hispanic eras to the nineteenth century, and then I conveniently strayed only north. Part of it, I think, emerged from an almost desperate desire to tell a narrative alternative to those previously composed about this population north of the line. My model had been the works of Eric. R. Wolf and others like Richard N. Adams, books investigating big ideas over big areas. Few scholars had applied a similar scope to the Southwest North American region, with the notable exception of James Diego Vigil in From Indians to Chicanos. In my own book, I also expanded into the areas of art and literature, as well as social science and history. It seems that Border Visions has had resonance over the last twenty-two years, and it can still stand for that period and in part for today. However, it stopped at the border for the most part, even though most of the narratives and many of the experiences that I knew to be true were in fact transborder—culturally, linguistically, socially, and certainly economically. These include seeing my father come home one day saddened and shattered by being told to “go back to Mexico” when he asked for a raise in the automobile garage in which he had worked for many years, even though he had attended Roskruge Junior High and worked as a Western Union delivery boy as a kid in Tucson, Arizona. Or the countless stories of the Mexican Revolution that my mother told, including the tales of revolutionary young men dying of wounds in her home’s courtyard as her mother tried to staunch their wounds with pillowcases and bedsheets. This occurred while an explosive bullet to the stomach was killing her father, fighting on the opposite side. 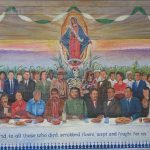 The narratives of multiple crossings went on and on: I was practically born on the dividing line between the two Nogaleses when my pregnant mother, my father, and my sister were returning to Tucson after visiting relatives in Magdalena, Sonora. Birth pains began a few miles from the borderline, and we barely made it to St. Joseph’s Hospital, where I was born. It was said that my bassinet was placed by the hospital window, which was next to the cyclone fence dividing Sonora from Arizona, allegedly with my feet facing south and my head facing north. So culturally, linguistically, economically, politically, and ecologically, I had not written Border Visions with what my early birth, almost between borders, taught me, nor did I reflect on growing up in the reality of the transborder region. I had paid insufficient attention to the enormous growth of the maquiladoras and the persistent and telling migration north during the 1970s, even though it was obviously present. New populations of Mexicans were moving from central and southern Mexican states into my old Tucson neighborhood, and the neighborhood changed from bilingual to monolingual Spanish-speaking. In 1985, I returned to the area and stopped by a local supermarket where I had worked as a teenager. Now its shelves were filled with Mexican brands, piñatas hung from the ceiling, and Spanish flowed through the aisles. I had been the only one of ten or twelve cashiers who spoke Spanish; those numbers were now reversed. Yet in the schools, the old, oppressive practices of monolingualism remain to this day. Teachers no longer punished children for speaking Spanish with “swats” to their rear ends, but there are more pernicious and supposedly “beneficial” techniques, such as the extensive use of tests and “immersion” to rid children of their invaluable linguistic and cultural resources. Coupled with an Arizona legislature determined to upend the demographic changes created by a transborder economy, the population once again faced many of the same educational circumstances that structured the way in which children learned, even though the pedagogies of “immersion” are known to be faulty, theoretically and methodologically. This is true to this day in many states and especially Arizona. I tried to make up for this inattentiveness since I had not adequately told the transborder narrative. So relatively recently I did so in three other books: An Impossible Living in a Transborder World (2010), Hegemonies of Language and their Discontents (2017), and The U.S.-Mexico Transborder Region (2017) with Josiah Heyman. The first is an economically oriented work that crosscuts the border bifurcation and lays out a sound theoretical platform from which to understand the movements and adaptations of Mexican populations moving north. The second book focuses on language policies filtered through the Spanish empire, the Mexican Republic, and the United States. It focuses on the impacts and responses to the imposition of language on populations inhabiting the “Southwest North American Region,” which is the ecological setting over which languages were impressed as one of the central means of reducing or eliminating the cultural underpinnings of Indigenous- and later Mexican-origin populations. The third book is a strong theoretically and methodologically informed collaboration of new and exciting young scholars who have experienced, researched, and lived in the region and who have nailed down the sources, processes, and structures of the asymmetry and inequality of the region. These complete a kind of triangle of works in English that makes up for the limitations of Border Visions, without which they would not have been developed. Yet even these were not sufficient in reality to fix the transborder narrative, because these were all in English. So I began to publish works in Spanish like Visiones de acá y de allá (2015) and a number of others with Mexican colleagues, and in so doing I have tried to cement a level of scholarship that is effectively transborder. Colleagues from the north and south of the bifurcation are equal partners in an otherwise asymmetrical economic and political region. Thus what began as a venture into a limited arena of scholarship north of the bifurcation emerged over the past twenty-two years as much more complete ecological, economic, political, cultural, linguistic, and social narrative of the Southwest North American Region. Carlos G. Vélez-Ibáñez is Regents’ Professor in the School of Transborder Studies and the School of Human Evolution and Social change and the Motorola Presidential Professor of Neighborhood Revitalization at Arizona State University. His numerous honors include the 2004 Robert B. Textor and Family Prize for Excellence in Anticipatory Anthropology and the 2003 Bronislaw Malinowski Medal. 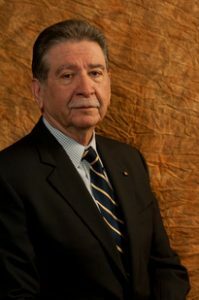 Vélez-Ibáñez was elected Fellow of the American Association for the Advancement of Science in 1994 and was named as a Corresponding member of the Mexican Academy of Sciences (Miembro Correspondiente de la Academia Mexicana de Ciencias) in 2015. 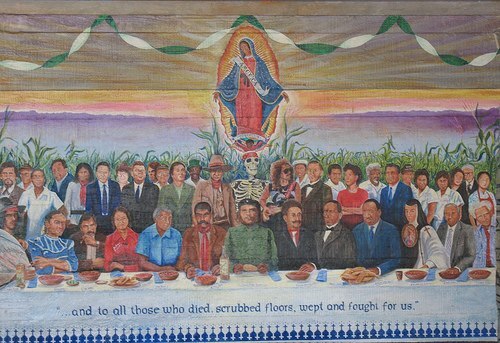 Mural, The Last Supper (José Antonio Burciaga at Casa Zapata, Stanford University) photo courtesy Gozamos, shared via creative commons license.